Confederate flag flying over state capitol in Columbia, South Carolina (2008). 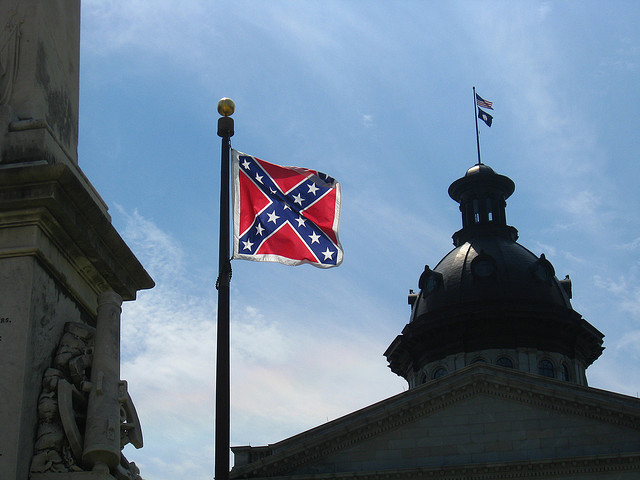 Boeing and IBM were among the large employers in South Carolina calling for the Confederate Flag to end its reign over the state capital before the state House of Representatives’ vote last week that sent the flag to a museum. The controversy over the appropriateness of the flag as a state symbol escalated after the racially-motivated slaying of nine people at a predominantly African American Charleston church last month. This is one of many examples cited recently by New York Times columnist Frank Bruni, who highlighted multiple instances where corporate leaders are advocating for solutions that bring people together, weighing in on issues of social justice, diversity and human dignity. Bruni identified nearly two dozen companies — from American Airlines to Nordstrom to Walmart, among hundreds of others — that have been speaking out on issues including anti-gay discrimination, immigration or race relations. Advocacy may come more naturally from business leaders than from politicians. Business is more in sync with broader public opinion, the column argues, than many politicians because often politicians respond to constituents most responsible for their re-election. The awareness of broader public sentiment apparently also holds true when political candidates make polarizing statements. Donald Trump’s recent comments on immigration resulted in Macy’s, Univision Communications and NBC ending business relationships with him. So business increasingly taking sides on divisive social issues raises a question. Is it merely pragmatism (based on the diverse employee and customer bases companies represent) or is it coming from an evolving sense of corporate social conscience – driven by leaders and organizational values and a desire for company strengths to make a positive impact on society? As it is too soon to know, there are benefits either way. To the degree companies are acting out of concern for the impact of social problems, becoming more comfortable expressing a corporate social conscience can lead to transforming self-interest into enlightened self-interest. Maybe not in every area, all at once or every time. But, it sets in motion the larger sense of seeing and relating to “the other.” Those impacted are no longer faceless and companies are less detached. This, in turn, sets the stage for more ethical outcomes. Enlightened self-interest is a chain reaction – by acting to advance others’ interests, it ultimately serve one’s own self-interest. It is reminiscent of the capacity leadership authority Stephen Covey advocated that leaders develop more than 25 years ago in 7 Habits of Highly Effective People — the ability to “think win-win.” As a tenet of principled leadership, this also reinforces the potential and capacity for ethical behavior impacting decision making both internally and externally. Even if the driver of the seeming trend of corporate outspokenness is pragmatic, it still has benefits. By getting involved in societal issues of discrimination, the light inevitably shines back on employee issues back home that companies need to address: including pay equity, equal access to promotion and advancement and even the impact of executive compensation policies on a culture. The question ultimately comes back to how individual companies can lead the way by leading themselves in directions that ensure they have environments where their own employees can flourish. Self-interest when it shifts into enlightened self-interest has significant potential to impact both society and individual companies. It is the essence of leadership, according to the late John C. Whitehead, former co-chairman of Goldman Sachs who authored the firm’s 1979 ethical and business principles. A type of leadership that can change everything. It Isn’t Altruism. Just Good Leadership.